Here's another Tips & Tricks post! The following tips for filling IV bags for your patient simulation are relatively simple, but essential! Open the roller clamp and fill the empty IV bag. 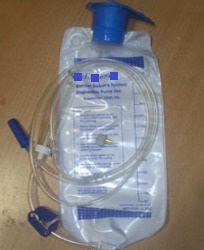 Plug the filled IV bag with IV tubing or a golf tee. The Tips & Tricks section is located in our Resources section on caehealthcare.com. The Resources section of the website will also give you access to important and helpful documentation and video tutorials for your simulators.